Small Wedding Venue Idea - Romantic & Affordable : Get Married In the Revs Home! Rev. 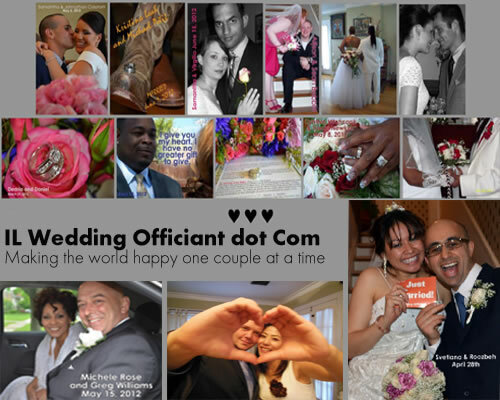 Pamela, IL Wedding Officiant of Chicago announces Wedding Officiant and Wedding Planning Services for the new year. Destination Wedding Chicago, Pine Manor. January 09, 2013, 1:18 pm -- /EPR NETWORK/ -- You'll immediately fall in love with this quaint get-away in the suburbs. Pine Manor provides an alternative to a typical wedding venue adding an ole time quality found only in the Rev's private home. Elope or 30 guests GLBT & Interfaith garden avail. Looking for a way to personalize an intimate wedding ceremony and reception without having to sell your car? Or maybe you just want it to be the two of you - romantic. CHECK OUT ILWeddingOfficiant.com Pine Manor and Rev Pamela might be a perfect match. Couples travel from all over to Pine Manor, wedding destination Chicago, couples have even come from Europe to be married by Rev. Pamela in her manor garden. This sweet small wedding venue is the officiant's private home located in the NW suburbs. Rev. 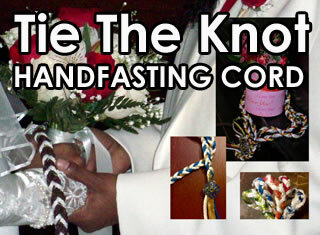 Pam also hand makes handfasting cords Handfasting Cord .net and custom poured wedding unity candles. Both made personally by Rev Pam for the wedding couple. The 7 foot handfasting cord take 4hours to create and has four prayers marked with beads along the handfasting cords braid for the couples health happiness and protection. The handfasting tradition started well before the church married people and is the origin of the expression "they are going to tie the knott" A beautiful ritual to include with a ring exchange and can easily be adapted to incorporate children from first marriages. After the ceremony the cord become a protection tool for the couple. Rev Pamela is happy to custom write a ceremony and vows for your officiant to preform. The unity candle is created much the same as the handfasting cords with prayers written on rice paper and sunk into the wax of the unity candle as it is being poured. The colors are selected by the couple and a stone bead is placed at the bottom to create a talisman of good luck after the candle is completely burned. Wedding Date Psychic, choose a lucky wedding date, how to choose a lucky wedding date. This reading is extensive and will not only call out specials dates and why, but also give you a glimpse into your partnership and future. Consult with Rev Pam before choosing your date. Chinese couples consult a fortune-teller to help them choose the luckiest wedding date. This 5,000-year old tradition comes alive when Rev Pamela dose a wedding date reading for you. It will help you select the luckiest date for your special day. Rev Pamela uses Germanic Rune divination combined with personality, astrology and numerology evaluation to determine the luckiest date for you and your fiancé to get married. This will get you started in the right direction to ensure a couple's lifelong happiness, harmony and prosperity. Rev Pam will inform you of lucky signs and fortunate omens based on astronomical activities, such as moon phases, Venus in retrograde and ole wedding traditions all explained in detail when you receive the printout. She also studies the names of the bride and groom as well as the year, month, day and hour of their birth dates, which is referred to as the Four Pillars of Destiny. The detailed writeup you will receive will incorporate information on birth order personality traits, a compatibility astrology chart and provide a complete write up which is often five to seven pages long. An invaluable source book of information on the two of you together. LOOKING FOR A MAGICAL WEDDING GIFT? Prayer Bottles ( or witch bottles) are an old practice where the wise woman of the village would create a special prayer of protection and success and give it to the couple on their wedding day. Rev Pamela has brought back this the Old tradition with her bottle spells. Each bottle spell is created specifically for the couple, herbs, magickal oils and prayers are captured in an ole time bottle and boxed in a hand-made fashion. Details of the prayers and bottle accompany every order. This unique wedding venue offers an intimate, home elegance perfect for a small guest list of up to 30, or a private elopement to Chicagoland's Northwest suburbs. A Cook County Courthouse wedding alternative for quick ceremonies and a small event venue, the home features a 1920's touch with honeymoon suite, home cooked catering and wedding packages for every budget. Chicago Wedding Minster, Rev. Pamela will perform your ceremony in a magical way that will touch your soul and inspire your future together.